King Cobra (Executive Scooter),A scooter with Innovative design with a built in usb to charge your mobile device. Large air wheels for smooth ride and a wide captain size seat. Live life cobra size. A scooter with Innovative design with a built in usb to charge your mobile device. Large air wheels for smooth ride and a wide captain size seat. Live life cobra size. This cobra has a new design to suit this decade and a style to show off. A single touch infinite tiller adjustment helps you ease into a driving position that suits you. The newly built handle using ergonomics delta control makes life easy for people who get older and loose strength and are limited to work with their hands. The ergonomic handle helps to manoeuver this scooter with ease. Technology advancement – A built in USB port for charging your devices. Drink, drive and hold your cup in a built in cup holder, but only coffee or water please. Heavy duty and large air filled tyres having full suspension so you can have a bump free ride. Latest blade style alloy rims. Strong and extra bright LED lighting which is very effective and efficient. A Captain seat which is 22" Wide Full-size, stylist sports style and very comfortable. Adjust your seat for height, make it swirl and also recline your backrest for resting in your scooter. This scooter features padded armrests to easily turn cylinder and adjust your angles. Free wheel and easy mode. I wanted a scooter for my dad and this one ofcourse is a little extra and over the edge as compared to other available scooters. The added features in this scooter like the usb port, cup holder, tiller adjustment, wide seat makes it a special scooter for my dad. Price wise it is little expensive, but if you compare it across the internet, these guys are cheaper. When we received this scooter and my dad drove it around, the price was fully justified. 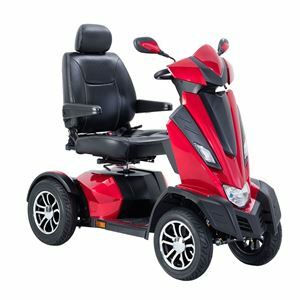 A very comfortable scooter for old age people who need to move around independently. I will definitely recommend this scooter to anyone who wants comfort and style. This looks like an edgy and a sleek scooter which would be a cut above the rest of scooters. Although a little on the higher price range, but comparable. The staff is also helpful and very supportive. Looking forward to receiving my scooter. If you are looking for style, class and comfort, all in one and do not mind splurging a little, then this is the best scooter. The mighty king cobra is very aptly named. I ordered mine last month after checking its features and video. I received it in a good condition and after riding it around, I have no regrets at all. This is THE scooter that I was looking for. It has given me mobility in a way no other scooter would have given. So comfortable and easy with all those extra special features and utilities.